Learn to "Leave no Trace" in the great outdoors! Yield the trail to other folks according to this Forest Service diagram (at right, click on it to enlarge). National Park Service says "Trail running is discouraged as there have been an increasing number of injuries and fatalities due to runners surprising bears at close range." Montana Dept. of Fish, Wildlife and Parks says "Travel in groups of three or more people whenever possible and plan to be out in the daylight hours." 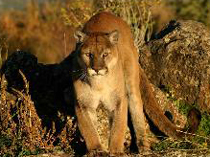 MDFWP also offers more great tips on how to travel, fish, hunt, and camp safely in bear and mountain lion habitats. 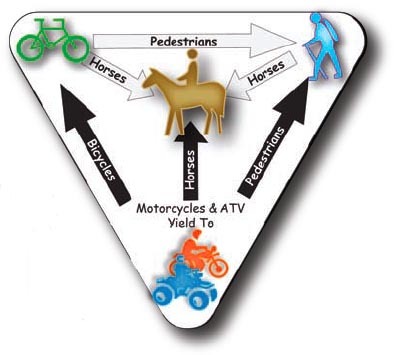 The Forest Service offers good advice for safely enjoying a broad range of activities in your National Forests. 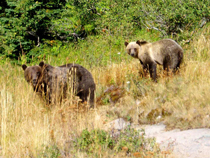 The Center for Wildlife Information offers good information on how to Be Bear Aware while living, working and playing in bear habitat. You can also help preserve the backcountry for wilderness-quality experiences by adopting the "Code of Responsible Recreation for America’s Backcountry!"